In 2009, Northwood Manufacturing made a significant change to their Arctic Fox line-up when they discontinued the 990 dry bath and introduced an all-new dry bath model, the Arctic Fox 992. Of course the 990 wet bath remained in steady production and continued its reign as Northwood’s most popular truck camper. Seven years later, the 992 dry bath has joined the 990 wet bath as a top seller for Northwood. In fact, we often speak with Arctic Fox prospects who are choosing between these two models. Arctic Fox doesn’t make this any easier by making the MSRPs identical for these two single full-wall slide floor plans; $33,108 (with the Fox Value Package) for either the 990 or 992. Looking deeper into the specifications, the 992 is longer (10’2” vs. 9’10”) and about 225 pounds heavier. The grey tanks are identical at 39 gallons, but the fresh tank in the 990 is bigger (59 gallons fresh vs. 46 gallons fresh) as is the black tank (43 gallons black vs. 37 gallons black). If one of these factors is a make or break, you have your answer. In reality, most of us choose one truck camper model over another based on the floor plan, and that’s where the 992 really sets itself apart. First, it has the largest dry bath of any Arctic Fox truck camper. If you want a big dry bath in an Arctic Fox, the 992 is your unit. Second, the 992 has its full-wall slide on the driver’s side. Every other full-wall slide Arctic Fox makes is on the passenger’s side. For some, the side where the slide is located is very important. Third, there’s the overall impression of standing in the 992 versus the 990. While the family resemblance won’t be missed by anyone, these campers are definitely not twins. Put another way, it’s likely that you will prefer one over the other in person. For deeper insights into the Arctic Fox 990, check our 2015 Arctic Fox 990 review (and admittedly wacky Colorado adventure). Don’t miss Fluffy. 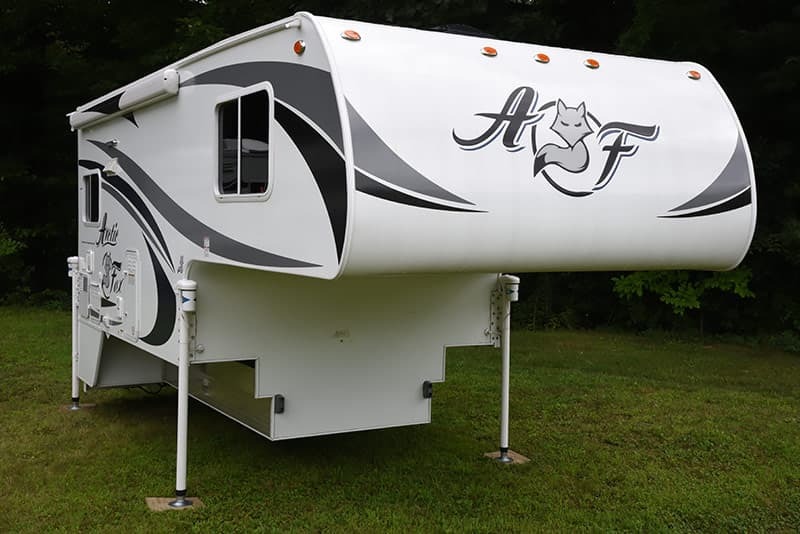 We have been wanting to review an Arctic Fox 992 for some time and finally found the opportunity at Truck Camper Warehouse in New Hampshire this past August. As luck would have it, a shipment of two 992s had recently arrived with the new-for-2017 cathedral ceiling and other 2017 updates. Would the new cathedral ceiling make much of a difference? Is the 992 a worthy challenge to the ever-popular 990? We rolled up our sleeves for another in-depth review. Any suggestions that the new cathedral arch ceilings wouldn’t make much of a difference can be put on a wooden boat, pushed out to sea, and repeatedly shot with flaming arrows. The cathedral arch ceiling is an instant show stopper giving the 992 a distinctly larger and more spacious interior feel. 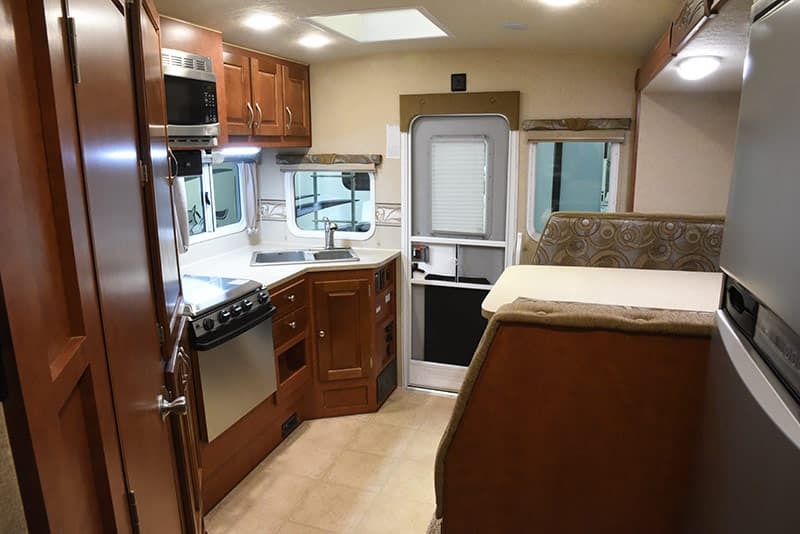 While we were at Truck Camper Warehouse, we looked at Arctic Fox models with and without the cathedral arch ceilings and it was surprising how big of a difference the taller curved ceiling made both aesthetically, and in the overall vibe of the camper. This is the kind of design feature that you have to experience in person to fully appreciate. The photographs don’t really convey the difference. 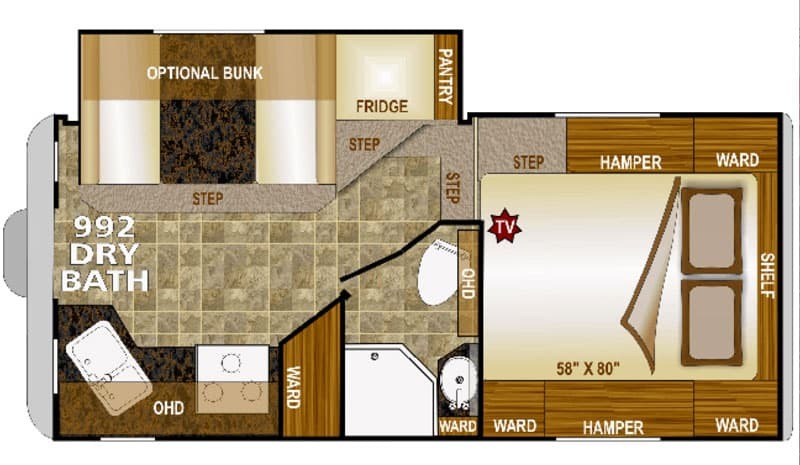 Literally every area of the interior is affected by this change; main living area, bathroom, and cabover. If you are considering a 2017 Arctic Fox or another competitive product, you need to see this. The only downside of the new cathedral arch ceiling is that it made climbing on to the roof more difficult. Specifically, it’s tough to bridge the gap between the top of the rear ladder to the taller roof while getting up and over the rear awning. This would be much easier, and safer, if Northwood added a grab handle on the roof that lined up with the ladder. When we did get on the roof, we were very impressed with the quality of the seals and the neat presentation of the TPO fiberglass and roof features. 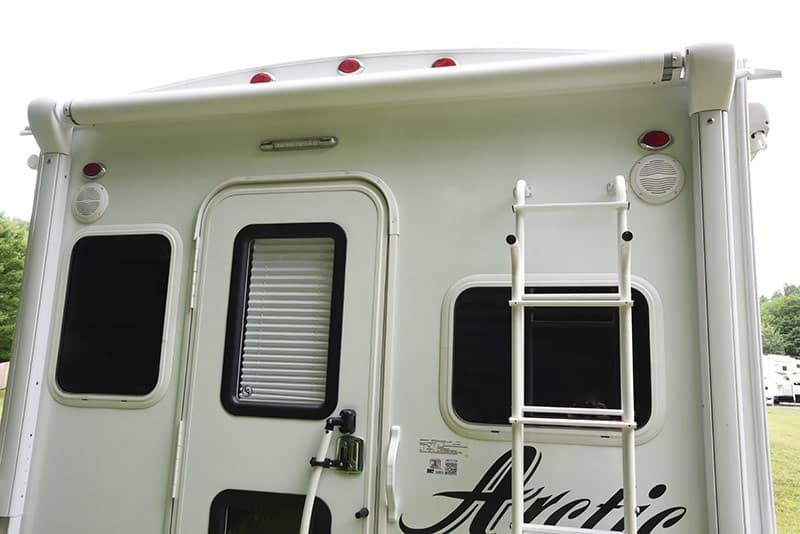 Northwood vacuum bonds its truck camper roofs giving them a solid and tight finish. Very impressive. Anyone who enjoys preparing meals on the road will probably love the passenger’s side kitchen. 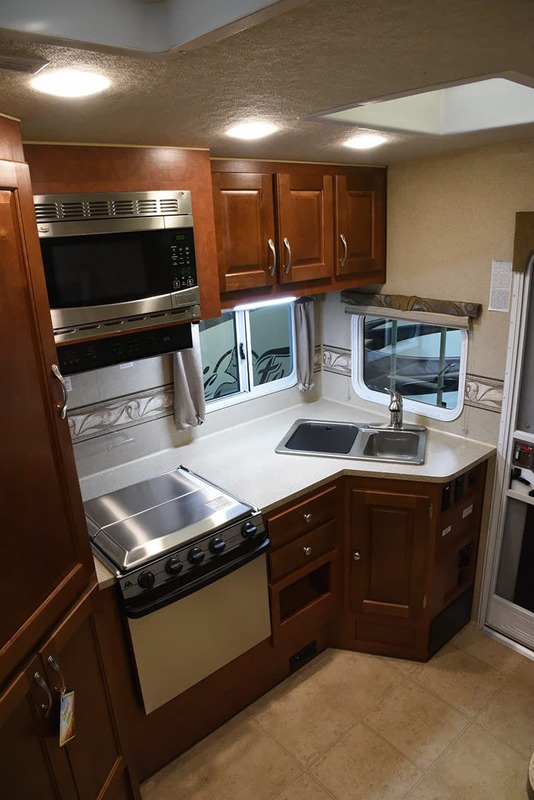 With a respectable amount of counter top space, double sink, lots of upper and lower cabinetry, a stainless steel microwave, propane range top, and oven, even the traveling gourmet among us should find what they need.